Welcome to Friends of the South End Library (FOSEL). 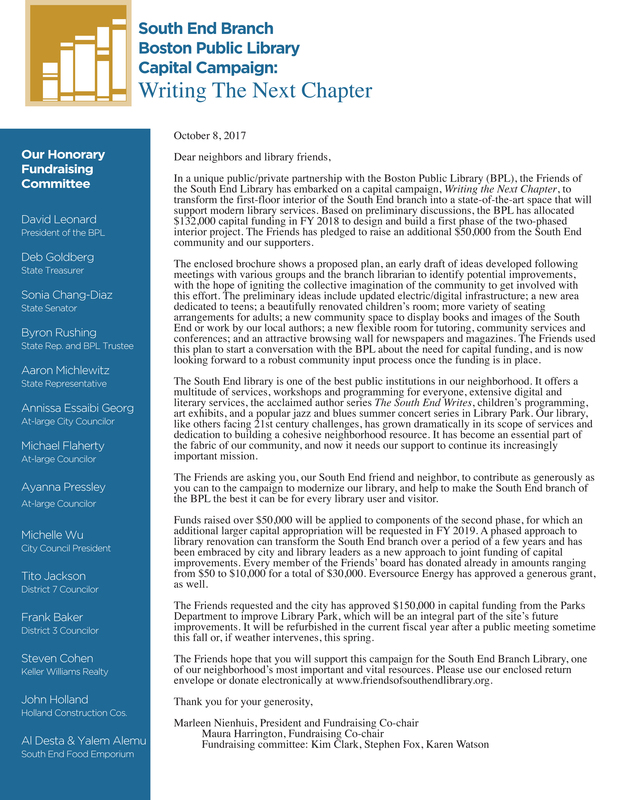 As a not-for-profit organization, we are committed to making the South End branch of the Boston Public Library (BPL) a vibrant civic space within our community with exciting programming created for you, based on our board's and library staff's suggestions, as well as yours. We make them available with private funds FOSEL raises from you, our loyal supporters. They include the acclaimed South End Writes author series; the popular Annual Easter Egg Hunt; the Local/Focus window displays about South End artists, non-profits and creative entrepreneurs; the fabulous Summer Jazz & Blues Concerts in Library Park, and requests for financial support by library staff for events and workshops. FOSEL programming is listed below in UPCOMING EVENTS. News and reports about previous programming can be found underneath in RECENT NEWS AND UPDATES. FOSEL programs are separate from the many great products and services the BPL provides to each of its branches, as part of the annual BPL budget. To visit the BPL's South End website, click here. To visit the BPL's general website, click here.